This installation occupied the mud room, and shared a space with the installation of rubber fish. 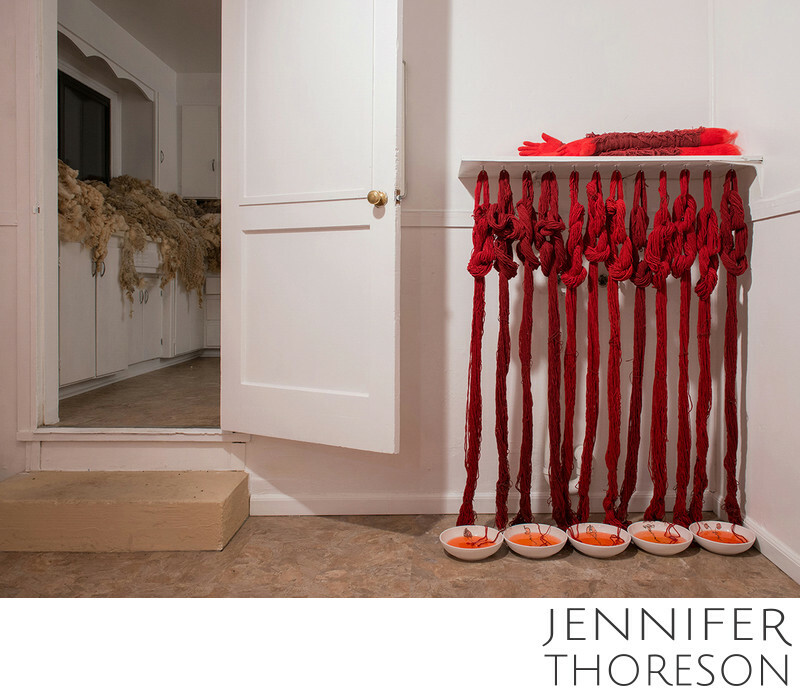 Twelve warping chains of red wool yarn hung below a storage shelf, signifying the number of twelve disciples. Each chain was wound on a warping board, a step taken in preparation for warping a loom for weaving. The method orders the yarn and prevents it from becoming tangled or damaged in the process of installation on the loom. When learning to weave, I always found the process of winding a warp to be quite meditative, and the chain itself to be very beautiful. The red chains are body-like, reminiscent of muscle fiber or veins. The ends of each warping chain rested in shallow bowls of water. Over the course of the evening, the water became progressively stained with the red pigment that had not yet been washed from the dyed yarn. The installation echos the meaning of the installation of fish, depicting a bloody stain, and illustrating the progression from innocence to iniquity.